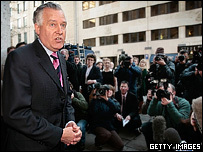 Peter Hain has quit the cabinet saying he wanted to "clear his name" after his Labour deputy leadership campaign donations were referred to the police. The Electoral Commission passed the work and pensions and Wales secretary's late declaration of donations to police after a "thorough review" of the case. In a statement Mr Hain said he felt he had "no alternative" but to resign. James Purnell takes over at work and pensions with Andy Burnham replacing him as culture secretary. As the reshuffle sparked by Mr Hain's departure continues, Paul Murphy has been named as the successor to Mr Hain as Welsh secretary. Yvette Cooper will join her husband Ed Balls in the cabinet by succeeding Mr Burnham as chief secretary to the treasury. Caroline Flint becomes the housing minister. Among other changes in the junior ministerial ranks, Tom Watson - who quit the government in September 2006 after an "attempted coup" against then Prime Minister Tony Blair - returns as Parliamentary Secretary at the Cabinet Office. There is also a promotion for another Brown ally, Baroness Vadera, who becomes under secretary of state at the department of Business Enterprise and Regulatory Reform. Immigration minister Liam Byrne is given an additional role at as a junior minister at the Treasury, boosting his efforts to clamp down on illegal working and migration. Earlier, speaking outside the Department for Work and Pensions, Mr Hain said: "I severely and seriously regret the mistake in declaring the donations late." Mr Hain, who has said suggestions that he tried to hide anything are "absurd", earlier wrote to Prime Minister Gordon Brown: "I made a mistake but it was an innocent mistake." In his reply, Mr Brown wrote: "I recognise that, given the circumstances and your desire to clear your name, this is the right and honourable thing to do." He praised Mr Hain's contribution to the government, adding: "I know that you will continue to make a contribution to public life in the future." It is the first ministerial resignation of Mr Brown's premiership. Conservative leader David Cameron said: "It's the right decision, but it shouldn't have happened in this way." "I said some time ago the prime minister should have said to Peter Hain you've got to give a convincing explanation of your situation or you can't stay in the cabinet, instead we've had a long delay where one of the most important departments in government hasn't been led properly." Shadow home secretary David Davis said the key questions that needed answering were what Mr Hain knew and the status of the Progressive Policies Forum, through which some of the donations were channelled. Mr Hain joined Labour in the late 1970s after leading the campaign against the apartheid regime in South Africa, going on to be one of its longest-serving ministers. He played a key role, as Northern Ireland Secretary, in negotiations to restore the power sharing executive. But his bid to replace John Prescott as his party's deputy leader ended in failure when he came fifth out of six contenders and his campaign was left with huge debts, which it tried to clear by seeking donations from wealthy individuals. Mr Hain declared 17 of these donations - totalling £103,000 - more than four months after the contest ended, placing him in potential breach of electoral law. Mr Brown stood by Mr Hain saying he accepted the minister's explanation that the late donations were down to "an incompetence". But the Electoral Commission said it had decided to call in the police following a "thorough review" of the evidence. Commons leader Harriet Harman, who won last year's deputy leadership race, paid tribute to Mr Hain earlier during business questions in the Commons. She told MPs: "I regard the work my right honourable friend has been doing (as) important work for people in this country and I personally regard him as an excellent colleague and a good friend." Giving his reaction, Lib Dem work and pensions spokesman Danny Alexander said: "The transition from Blair to Brown feels increasingly like the transition from Thatcher to Major."